A recently launched report by the Arab NGO Network for Development aims at defining the gender dimensions of informal labor in the region. 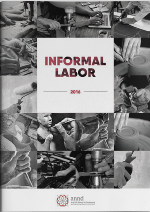 The study on the gender dimensions of informal labor, written by Dr. Howaida Adly, Political Sciences Professor at the National Center for Sociological and Criminilogical Research (Egypt), focus on commonalities between all Arab countries in terms of labor and gender, and on the differences among them. The analysis is based on national reports received from the different Arab countries. 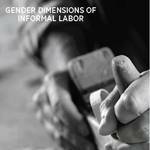 A common limitation is that data is lacking to allow for a comprehensive assessment of the gender dimensions of informal labor. What do the SDGs goals mean for Arab women? A region overwhelmed by violence and conflicts* Moreover, the realities of women in the Arab region are influenced, directly or indirectly, by the recurrence of conflicts, including state crisis, wars, occupation, and the onslaught of religious fundamentalism and militarized religious extremist group. While the implications on rights and broader political, social, and economic realities differ in these circumstances, they all leave women subjected to various forms of violence and exclusions. It is not expected that the region will be free of these cycles of conflict and violence in the short term; thus the manifestation of this violence will inevitably continue shaping the lives of women and men living in the region. Several challenges hinder the implementation of the 2030 Agenda on Sustainable Development in Lebanon. During the UN Conference on Sustainable Development in September 2014 Lebanese President Tammam Salam identified the humanitarian issues caused by the Syrian refugee crisis as one of the greatest challenges to development. It is indeed a significant constraint; yet, one should note that Lebanon was facing a political and socio-economic crisis reflected by a high rate of unemployment and marginalized people, even before the Syrian crisis and the flood of refugees. Therefore, it is worth highlighting that the Syrian war shed light on the structural and systemic problems of Lebanon and aggravated them. To date, Lebanon does not have a national strategy for sustainable development nor a national economic plan nor a poverty reduction strategy. 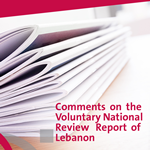 According to the 2014 International Parliamentary Union Secretary General’s annual report: “the Lebanese Parliament reported that the Sustainable Development Initiative was in the agenda of the Public Work Committee between 2009-2010 period. The current political instabilities, however, forced the Parliament to shift its priorities.” The same report indicates that the Parliament has not been informed of the Sustainable Development Goals (SDGs) and has not taken any steps to discuss them. Arab NGO Network for Development (ANND) held a seminar to discuss issues related to Business and Human Rights in the context of the Pilot Project for the Promotion of Social Dialogue in the Southern Mediterranean Region. In the context of the Pilot Project for the Promotion of Social Dialogue in the Southern Mediterranean Region (SOLiD), in partnership with the International Trade Union Confederation (ITUC) and BUSINESSMED, ANND held a two day seminar in Beirut on 7 and 8 September 2016, to discuss issues related to Business and Human Rights. Roberto Bissio, Social Watch Coordinator, joined the workshop participating in Session 1, The privet Sector and the New Development Paradigm - A Rights Based Perspective, Financing for Development from a Rights Based Approach (see his intervention below). 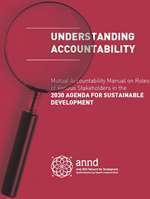 Arab NGO Network for Development (ANND) releases the Mutual Accountability Manual on the roles of Different Stakeholders in the 2030 Agenda for Sustainable Development. This guide provides assisting tools for the civil society to play its role within the framework of accountability of the parties concerned with the developmental process, from the public sector as a key partner in the development process and its basic point of reference in the context of policy-making and ensuring the proper implementation and protection of the rights of the citizens, to the private sector as a partner who is supposed to adhere to international standards of human rights, and the donors who are committed to providing the necessary resources for the implementation of the development process and achieving the goals of civil society. Freedom of association is an enabling right that underpins inclusive development. The social movements that have flooded the streets of the Arab Spring have the potential to democratize the state and secure democratic transition. However, what Europe calls "Southern Neighbouring" countries are recording alarming shrinking space for civil society, violations of freedom of association and peaceful assembly, coupled with restrictions of the right to access to information and challenges in mobilizing financial resources. The Arab NGO Network for Development (ANND) hosted a meeting on Tuesday August 18, 2015 with Mr. Leonardo SC Castilho, a Human Rights Officer from the Office of the High Commissioner for Human Rights for the United Nations in New York. 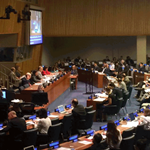 The meeting comes in the lead up to the UN General Assembly in New York in September – where Sustainable Development goals (SDGs) will be adopted – and a month after the Addis Ababa Conference on Financing for Development (FfD III). The meeting oversaw an interactive discussion between various Lebanese organizations and the representatives from OHCHR on the outcome document of the United Nations Summit for the adoption of the post-2015 development agenda. In the eve of an official regional forum on sustainable development, the Arab citizen organizations proposed alternative strategies. The NGO Network for Development (ANND), in collaboration with the Economic and Social Commission for Western Asia (ESCWA) and with the participation of the Civil Society Division in the League of Arab States, spelled out policy alternatives and submitted them to the governments. Read here the "Alternative Development Strategies for Post-2015: Exit from the Current Policy Approach". 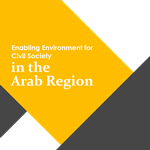 The Arab NGO Network for Development (ANND) organized, in cooperation with the CSO Partnership for Development Effectiveness, a sub-regional workshop held in Beirut, Lebanon on January 24 and 25, 2015 for the Levant states. This workshop, aimed to assess and determine the mechanisms and prospects of accountability for the various parties involved in development, be they governments, donors, civil society organizations or the newcomer, i.e. the private sector. Sessions focused on two issues, accountability and the civil society working. The workshop was attended by representatives of organizations from Lebanon, Syria, Jordan, Bahrain, Iraq and Palestine. The Arab NGO Network for Development (ANND), in collaboration with Christian Aid and Social and Economics Policy Monitor Palestine, explore in their comparative study on “Tax Systems in Six Arab Countries” how the tax systems of Arab countries have contributed to the lack of opportunity, growing inequalities, marginalization and exclusion suffered by the majority of people living in the Arab region. The revolutions witnessed by some countries in the region and the instability and crises in others are in part a demonstration of the people’s rejection of these inherent structural disparities. Paradoxically, as the report shows, it is the tax policies of these countries that present one of the key means by which local resources could be redistributed and mobilized to restore socio-economic justice to the poor and to foster more self-reliant development. The Arab NGO Network for Development (ANND) hosted the European Investment Bank (EIB) Vice President, Mr. Philippe de Fontaine Vive along with a team of EIB staff and representatives of the EU delegation to Lebanon on June 10th. The meeting brought together representatives of Lebanese Civil Society and international organizations working in Lebanon. ANND's work and monitoring of the EIB's involvement in the region prompted such a meeting. Since 2005, we could see a change in the EIB policies, which has chosen as interlocutor private local banks with three different measures. The first one enters in the micro-credit process to "facilitate households' access to credit", the second one consists in the implementation of private investment funds for the SMEs and the last one consists to negotiate directly with the local private banks on projects to finance SMEs from specific sectors. One cannot discuss policy priorities and challenges in Lebanon without first addressing the dangerous developments the region is currently experiencing. Oppression, backwardness and the shortcomings of democracy in the region as a whole are serious hindrances that could turn the tide and reverse the more positive trends. Despite the challenges they raise, the current developments clearly demonstrate the potential for change in the region: people are no longer willing to stand idle in the face of tyranny, poverty, unemployment and marginalization. Lebanon is still facing the systemic challenges of the political confessional system. The state must be an institutional and constitutional expression of democracy and people’s rights. Genuine citizenship cannot be achieved without the rule of law, without a system that gives citizens their rights and duties towards both society and the state, which are also preconditions for an effective civil society. Thus the main obstacle to true citizenship in the country is still the partition of state offices and institutions among the different religious confessions. The political stalemate continues in Egypt; the dismissal of the Rabeaa and Al‐Nahda sit‐ins was one of its bloodiest events. 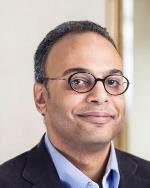 Although many players are keen to protect the Egyptian state, safeguard its persistence and support its role, efforts are still required on all fronts, including the international front, to reach effective and permanent solutions s that respect human rights and allow for a resumption of the transitional political process. This process includes promulgating a new constitution that meets the aspirations of all Egyptians s of all factions and affiliations and making conditions suitable for holding fair, democratic and unchallengeable elections. This will guarantee the right of Egyptian men and women to decide a future for them and for their representative institutions. 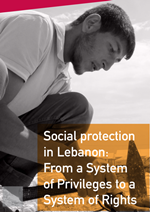 The Arab NGO Network for Development (ANND), Beirut released a statement on August 27, 2013. In terms of gender equity Lebanon is above the Middle East and North African average, and also above neighbouring Syria, although in worst situation than Israel, which bares the best score in the region. “Poverty eradication and women empowerment are our priorities” said Lebanese minister of Finance, Raya Haffar Al-Hassan at the joint launch of the Social Watch report in Arabic and the Arab Assessment of the Millennium Development Goals that took place in Beirut on July 9. Speaking in Behalf of the Arab NGO Network for Development, Ziad Abdel Samad welcomed the minister as “one of us”, remembering her past association with civil society organizations and with the United Nations system, for which she worked before joining the government. He welcomed the public discussion of the budget that is currently happening “for the first time in Lebanon” and challenged the minister to go one step further and invite civil society organizations to actually participate in the elaboration of future budgets. A group of Lebanese CSOs will deliver to Kofi Annan, UN General Secretary, a letter during his visit to Lebanon and the region. STOP THE WAR ON LEBANON! Civil society groups from around the world are increasingly raising their voices for an immediate cease-fire. The Arab NGO Network for Development (ANND), the regional focal point of Social Watch in the Arab world, has issued from Beirut the following updates on the situation. Amnesty International published findings that point to an Israeli policy of deliberate destruction of Lebanese civilian infrastructure, which included war crimes, during the recent conflict. Let us imagine that we are having tea on a sunny day with our neighbours. Today, July 30th, another massacre was committed in Lebanon: More than sixty civilians, among them 37 children, were killed by Israeli bombs while they were sleeping in shelters in the village of Qana. They died not very far away from the mass grave holding the bodies of 106 civilians burned by a previous Israeli attack in April 1996 inside a shelter provided by a UN battalion. A number of Lebanese, Arab and international organizations held a meeting on July 15, 2006 to discuss the current situation in Lebanon. Press release issued by Human Rights Watch on July 30, 2006. It calls on the UN to establish an international commission of inquiry and states that Israel’s consistent failure to distinguish combatants and civilians is a war crime. Please note that we will be releasing an extensive report documenting civilian casualties in Lebanon from IDF attacks over the first two week's of the conflict this Tuesday or Wednesday. The Arab NGO Network for Development (ANND) organised a press conference for the launching of the Arabic edition of the Social Watch 2004 Annual Report at the Flamenco Hotel in Cairo, the 11 of May 2005. Representatives of various Arab Civil Society Organizations, from 14 Arab countries: Lebanon, Palestine, Iraq, Jordan, Yemen, Bahrain, Sudan, Morocco, Tunis, Algeria, Syria, Kuwait, Saudi Arabia and Egypt will attend the press conference. Like every year at the same period of time, the «Committee of the Parents of the Kidnapped and Missing Persons in Lebanon» works on popularizing its action, breaking the isolation to which the authorities try to confine it and bringing its claims to a successful conclusion. This year, due to the war prevailing in Iraq, the committee’s activity is likely to be marginalized and thus needs your active solidarity.